Embedded World is not as newsworthy a trade show as Mobile World Congress. However, it is very good for taking the temperature of the industrial Internet of things area, and there are some significant announcements made. Overall, the mood among the exhibitors here in Nuremberg is more upbeat than ever. At its largest pre-show partner event so far, Intel's IoT group hinted at raised targets for 2018 in a thoroughly upbeat presentation. People on many of the stands at the show are reporting higher adoption rates, projects scaling up and a real sense of greater optimism. Alongside this sentiment is a huge focus on edge computing, with several new hardware devices and the formation of partnerships as many players beef up their credentials in this area. With innovative marketing but no specific announcements at the show, and on a stand tucked away at the back of one of the further halls, Amazon Web Services (AWS) made its first appearance as an exhibitor at the show. It has used the event to highlight a number of announcements from its AWS re:Invent conference in November 2017, which brought several major steps forward in the Internet of things. 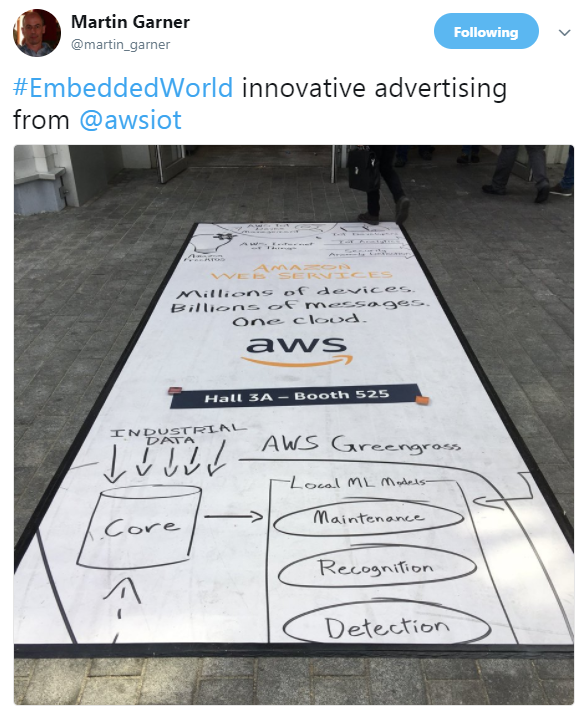 They include stewardship of FreeRTOS, one of the more popular real-time operating systems; AWS IoT Device Management for easy management of large numbers of devices; AWS Greengrass Machine Learning Inference for deploying and running machine learning models on edge devices; plus several other security and machine learning services to help developers. After a couple of years of being very quiet about Windows IoT Core, Microsoft has started to talk about the operating system again. 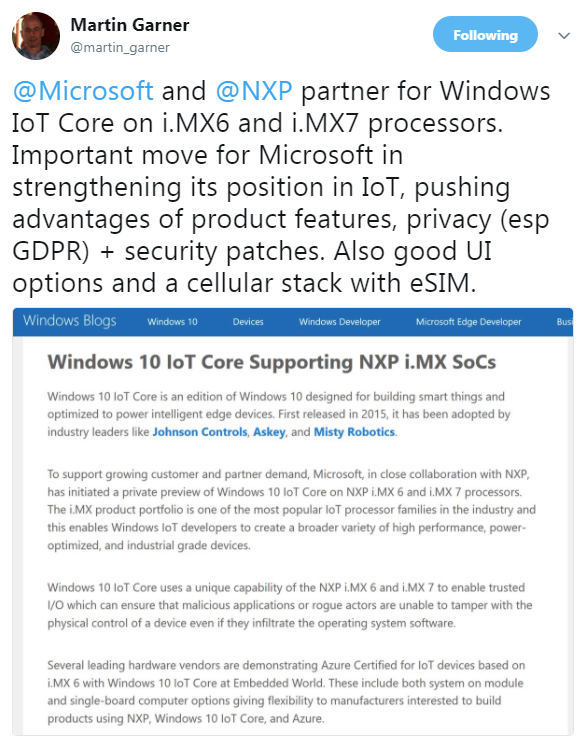 Windows IoT Core requires a minimum of 512MB of memory, so it clearly serves the upper end of the Internet of things market, but Microsoft touts its advantages in the areas of developer efficiency — thanks to its features, tools and documentation — security, privacy and patches. It has committed to 10 years of support for the release in fall 2018, and importantly announced a partnership with NXP Semiconductors for use on the latter's i.MX 6 and i.MX 7 processors. Samsung has decided that it needs common infrastructure across its various divisions as it heads toward its highly publicised goal of making all its products connected by 2020. It has embarked on a large project to integrate its various platforms for the Internet of things — SmartThings, Artik and later Harman's Ignite. These will serve its mobile, visual display, home automation and business-to-business activities. As this sizeable task runs in the background, the Artik business made several announcements at Embedded World. Firstly, it is partnering with PTC to integrate with the latter's ThingWorx platform for analytics, while using the Artik platform for device management. Secondly, it announced a new Eagleye 530 Artik development kit from Seeed, which is pin-compatible with Raspberry Pi devices to enable easy moves from pilots to full-scale projects. And thirdly it has partnered with Multi-Tech Systems to provide its first cellular connectivity option, in the shape of a starter kit offering an LTE Category 1 modem. CCS Insight's coverage of Mobile World Congress will continue later today, and reports on both events will appear next week. Sign up to our free Daily Insight service here.